Against the [AfD] Alternative für Deutschland — but not just against them! Nearly all commentators agree that the outcome of the German election is a “political earthquake”. Chancellor Merkel has come off badly, the Grand Coalition project has been punished. This underlines the declining credibility of the political establishment and the numerous crises that the previous government has kept under wraps, at least after a fashion. The entry of the racist AfD into the Bundestag is a sign of a drastic move to the right in society. In many places, the AfD was able to consolidate their gains in the last Land elections, and even build on them. According to opinion polls, many AfD voters made their decision on the basis of dissatisfaction with the established parties. Especially worrying is their penetration of parts of the working class, and the fact that it has succeeded to an increased extent in winning the votes of the socially disadvantaged. They have profited from social misery in this, and above all from a social climate marked by isolation and lack of perspectives, which allows political discontent and social anxieties to be all too easily transformed into aggression against weaker elements in society. Nevertheless, the frequent talk about “protest votes” cannot hide the fact that this “protest” was substantially a racist one. Rarely has an electoral campaign been so characterised by “law and order themes” and open racism. Politicians of all parties outbid each other with demands for more rigorous deportation procedures and more isolation of refugees, which offered the AfD an ideal point of attack for their inhuman propaganda. Repeatedly, AfD representatives argued that the so-called “old parties” had taken over their programme, thus adding further provocations in the same breath. They were therefore able to set the tone of the election campaign, and simultaneously put themselves on the scene as the supposed opposition to the establishment. Today, we can see the outcome. Thousands in various cities have demonstrated against the AfD: Spontaneously, in solidarity and with anger in their bellies. That was good, that was right! 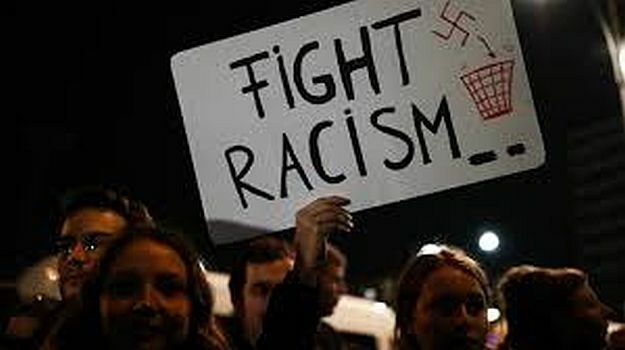 But resistance to rising racism is faced with great challenges and traps. Many are asking themselves the question: what’s the way forward? From the part of the bourgeois left there is now much lamentation over the necessity for broad social alliances against the AfD. What at first appears plausible, ends up advocating putting other things aside in the face of the danger from the extreme right and aim at defending the basic values of an abstract democracy in the broadest alliance of all honest citizens. Our problem with such moth-eaten concepts from the antifascist wardrobe is not so much that they do not go far enough, but rather they are simply and utterly capitalist in their entire logic. For what is the defence of “democracy”, but the defence of the glittering façade of a commodity society, which daily institutionalises racism and tightens the screws of exploitation, and, in this way, prepares the ground for reactionary forces like the AfD? Obviously, in the light of current developments, it is necessary to do something against the AfD and to proceed relentlessly against the nationalist and racist way of arguing. But to do this one shouldn’t place oneself as “anti-fascist” in “civil society” the or any relate in other way in to bourgeois democracy, rather it is a question of keeping class relations as a whole in view. Our resistance should therefore be directed not just against reactionary forces like the AfD, but, on the contrary, against relations of dominance which permanently reproduce exploitation, racism and violence. Under the present conditions it is difficult to oppose anything to capitalist delusions. But much has already been gained, if, in the day-to-day social struggles and confrontations, resistance and solidarity can be delivered, revolutionary positions can be introduced and the beginning of a political organisational kernel can be developed, which will serve as the point of departure for an attack on the dictatorship of capital. The success of the AfD racists should be enough of a spur to take up this task. For the state-less and classless society!